Robinson’s celebration of victory began with a hug from her competitor and friend, Evie Wiseman, who finished in second place. On Tuesday night, Mira Robinson — a third grader — won in the eighth round of the annual Belle Aire Spelling Bee. She was presented with a trophy and will go on to take an online semifinal test for a spot in the next round. 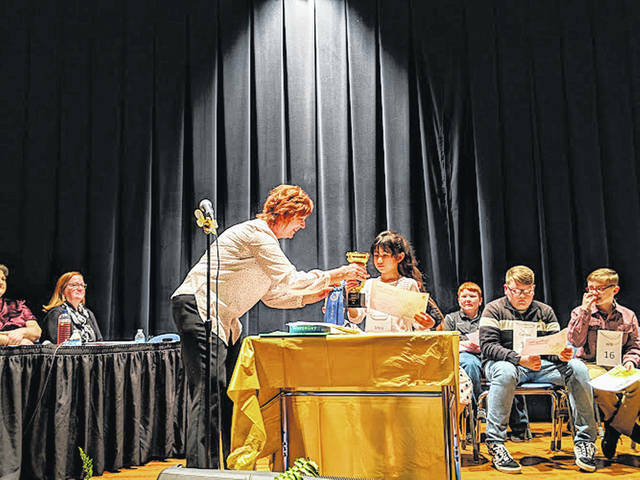 On Tuesday night, Washington Court House City Schools’ Liberty Hall was packed for an evening of academic competition, including a total of 32 students who earned their spot on the decorated stage for the annual Belle Aire Intermediate Spelling Bee. 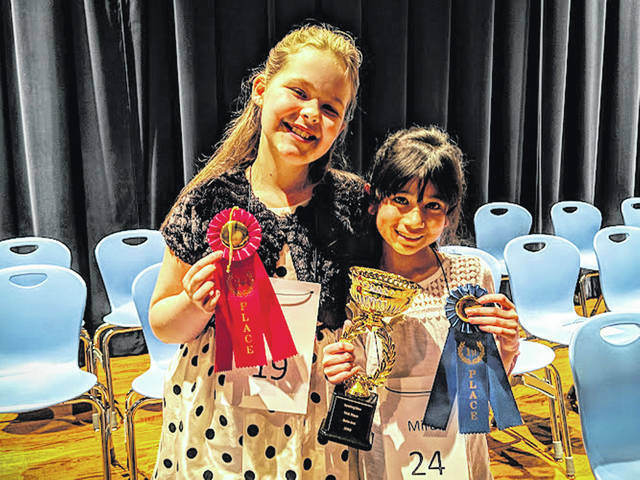 Mira Robinson — a third grader — won in the eighth round, earning the coveted title of Belle Aire champion. The winning word was “peasantry.” Her celebration of victory began with a hug from her competitor and friend, Evie Wiseman, who finished in second place. Robinson will go on to take an online semifinal test for a spot in the next round. If she qualifies, Mira will compete at the Scripps College of Communications at Ohio University. 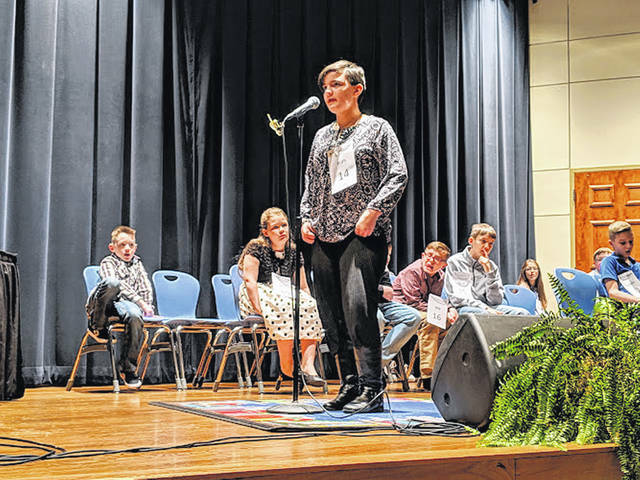 OU serves as one of the many preliminary hosts for the Scripps National Spelling Bee. More than 11 million students participate in the Scripps National Spelling Bee each year. The information in this article was provided by Washington Court House director of marketing and communications Trevor Patton. https://www.recordherald.com/wp-content/uploads/sites/27/2019/01/web1_MiraAndEvie.jpgRobinson’s celebration of victory began with a hug from her competitor and friend, Evie Wiseman, who finished in second place. 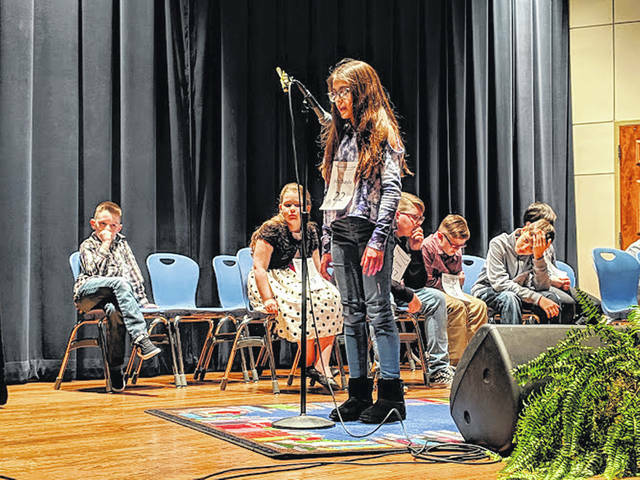 https://www.recordherald.com/wp-content/uploads/sites/27/2019/01/web1_MiraWins.jpgOn Tuesday night, Mira Robinson — a third grader — won in the eighth round of the annual Belle Aire Spelling Bee. She was presented with a trophy and will go on to take an online semifinal test for a spot in the next round.